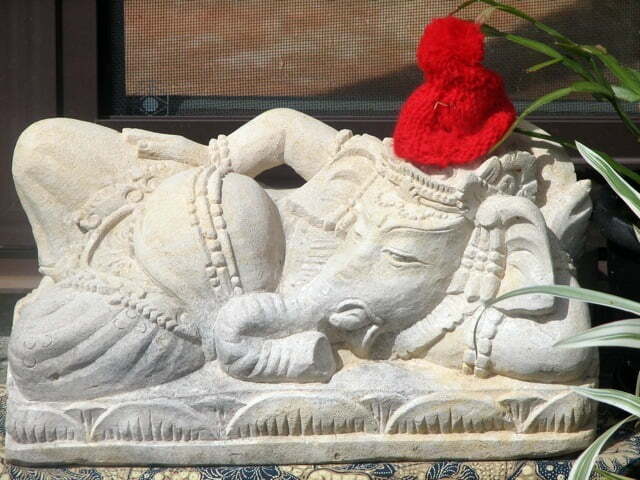 Ganesha, being the cool dude type of god he is, is sporting a Christmas beanie, at the same time as welcoming us into the Yoga Shed from his guardian position at the entrance. Revered for being the god of all beginnings and endings, Ganesha is the perfect host for any of our New Year’s Eve parties. As well, Ganesha is a top choice for being the muse of New Year’s resolution making. Let us all be so relaxed as he appears to be seeing out 2009 and letting the New Year in. And, let us take inspiration from him for the best of beginnings for 2010.